We are going through a cold snap here in Florida, and by cold I mean 30’s at night and 50’s during the day. Serious cold. When the temps get like this, thoughts of comfort food come to mind. 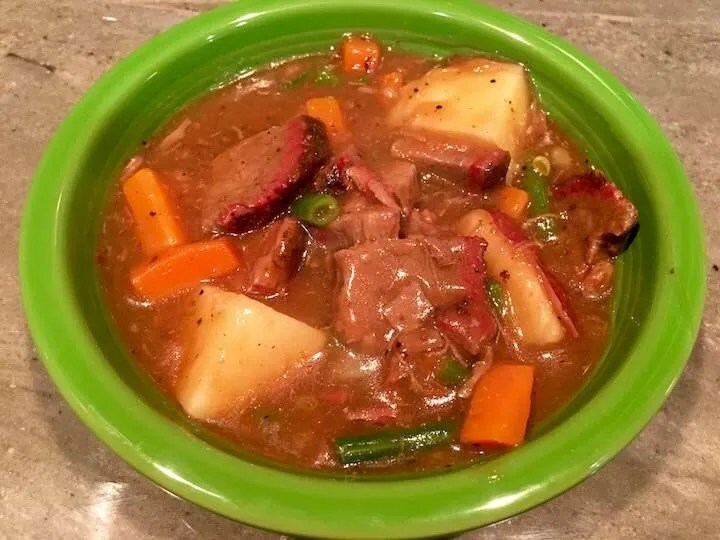 I had a bag of leftover 1st place brisket from the Zephyrhills contest, so brisket and vegetable stew seemed like a great choice. I do the cooking at our house and I like to keep things simple, fast, fresh, and flavorful. This recipe totally incorporates those characteristics. Wash the potatoes, pierce with fork, and microwave 6 minutes or until almost tender, turning once. Then cut into bite sized chunks. Cut the carrot sticks and green beans into thirds, steam for 4-5 minutes or until almost tender. In a large pot add a quart of water, the beef base, and any au jus you saved from the brisket. Bring to a gentle boil, and incorporate the cornstarch and stir to thicken. Boil 1-2 minutes more. 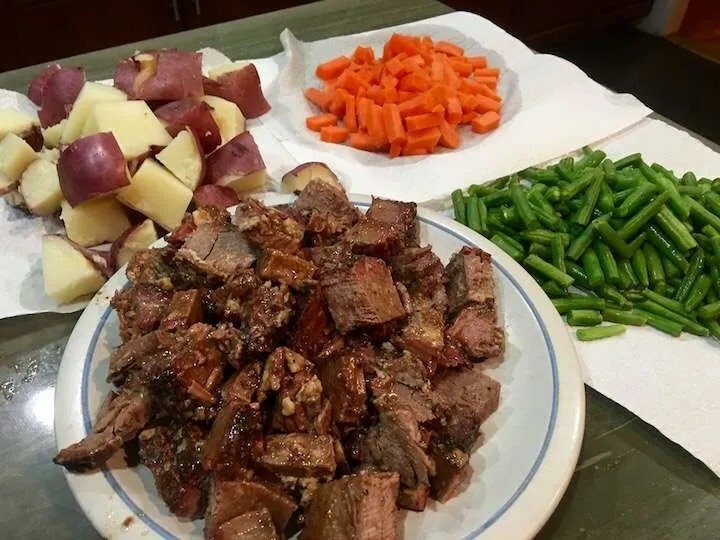 Reduce heat to medium, add carrots and green beans, stir for a minute or so, fold in the potatoes and stir gently so you don’t break them up. After a couple of more minutes add in the meat and Swamp Boys Original sauce and gently simmer another 4-5 minutes. Remember you are just warming the meat, not cooking it. Taste for seasoning and make adjustments. For a more robust flavor, substitute Swamp Boys Bootleg Red Sauce for Original. I like to add some BPS Dessert Gold and Everglades Seasoning. Enjoy! Less than a half hour for homemade beef and vegetable stew!